If you are looking for a table saw that is quality in design and safe to use, the DEWALT DWE7491RS is the right cutting machine for you. Weighing 110 pounds, the DEWALT gives quality sawing performance for all woodwork projects. The saw measures 31″ by 24.5″ by 31″ and operates on a 120V power source. The blade contains 24-teeth per inch and cut at a diameter of 10″. With the provision of a 3-year warranty, this is the perfect table saw for any contractor that’s looking for portablility. Put simply, with so many benefits attached to it, the DEWALT saw is an innovation designed for every modern woodworker. Can cut through wood materials of different strengths and densities. It’s safe from dust due to an effective dust collection feature. The saw is easy to assemble and use. It’s wheeled and thus easy to move around the workshop. Gives quality, accurate, and smooth results. At times, the stability of the saw is compromised when cutting dense materials. The miter gauge is plastic-made and thus not durable. How effective is the DEWALT DWE7491RS for beginners? The saw is simple in design and easy to use. It guarantees long-term use and can be used by both beginners and professionals. Does the DWE7491RS allow the use of Dado Blades? Yes, it does. You should first remove all the screws and loosen the nuts to detach it. Does the table saw allow easy removal from the base? When it comes to this table saw, there is no doubt that the cutting machine is among the best. To begin with, the design is highly distinctive compared to other table saws in the market. The rolling stand allows you to move the heavy saw, and you don’t have to compromise your health carrying the heavy machine around the work area. Another distinctive characteristic that makes this saw exceptional is its precision nature. Due to the provision of a large ripping surface, you can actually cut large and dense wood accurately. Considering that the saw guarantees quality and accurate sawing, there is no doubt about its effectiveness. Other than a few concerns about stability, the DWE7491RS is a must-have cutting machine for every woodworker. It comes with easy to assemble tools and warranty provision to guarantee quality and value of money spent. First, the saw comes with a spacious ripping capacity with the surface measuring 26″ by 22″. This work area allows you to achieve different cutting results. The saw can cut through and across strong and dense wood material. Secondly, the saw is driven by a powerful motor (15-Amp). The motor enables you to carry through thick and large wood chunks. Additionally, when it comes to cutting narrow wood materials, the flip over mechanism allows you to cut thin strips of the wood. Furthermore, the DEWALT DWE7491RS is portably designed. Its wheeled nature makes the saw an easy to push machine around the workshop. Lastly, due to its flexible design, the saw is used in a wide range of applications, such as the installation of cabinets, home remodeling, and the building of decks among other jobs. The saw is sturdily designed. This is highlighted by a wheeled and rolled stand. In terms of stability, this saw offers fairly effective results. The fence system of the saw allows smooth and fast adjustment of the machine. You can actually make adjustments when the machine is running, without the need to switch it off. The fence system improves the accuracy of sawing as it also saves you energy and time. Again, the safety features of the saw are indicated by a push stick and blade guard. This ensures that you are protected when sawing. In addition, the saw features a dust collection system, highlighted by a 2-inch port which you can connect to your vacuum of choice. This ensures that dust does not scatter in your workshop, and you do not compromise your health (through dust inhalation) or your safety (through the slippery nature of the dust). Lastly, the saw has an installed power reset feature that allows resetting of the machine after power interruptions. The saw requires regular inspection of the parts and maintenance. As for the miter gauge, which is prone to breakage under heavy sawing, it requires replacing when broken. In addition to the table saw, the DEWALT DWE7491RS pack comes with a folding stand, rip fence, blade wrenches, blade guard, carbide blade (24-tooth), and push stick. The accessories are meant to help you achieve quality cutting. They are easy to fix and flexible to use. Also attached to the accessories is a user’s manual to help you use the table saw. • Cabinet installers who handle sawing activities such as ripping filler boards and cutting of the cabinet parts. This is because the saw provides accurate and quality cutting of the boards. • Hardwood floor experts who install quality hardwood floors. The saw is known to cut through hardwoods of different densities. • Trim carpenters who handle different saw projects such as ripping crosscutting, ripping moldings, cutting shelves, and ripping frames. This is because of the cutting accuracy achieved by the saw. • Serious woodworkers who handle various woodwork projects, for DIY or professional reasons. They are able to obtain quality crosscuts and lumber framing. • Remodelers who are serious about achieving quality woodcutting results. They get to cut wood materials of different densities. • Deck builders who handle different wood projects such as ripping of deck boards and cutting of wood trim of different thickness. What Didn’t I Like about DWE7491RS? Looking at the DEWALT table saw, there are a few things that the manufacturer needs to improve. To begin with, the machine needs improvement on its stability aspects. Though it’s fairly stable, there is still room for improvement. Looking at the wheeled base, the saw can be made more stable to effectively rip thick wood chunks. Secondly, the meter gauge which is plastic does not appeal to me. I prefer metal since plastic is prone to breakage, and you have to incur replacement costs. Nonetheless, there are many positive attributes to admire about this saw. How Does DEWALT Table Saw Compare to Others? a) DEWALT DWE7491RS Vs Bosch 4100-09: When comparing the two, the DWE7491RS is slightly lighter (110 pounds) than the Bosch 4100-09 (125.2 pounds). In terms of warranty provisions, the DWE7491RS comes with a 3-year provision while the Bosch 4100-09 has a one-year warranty. Overall, this saw cuts through all wood surfaces of different densities, and it is more accurate than the Bosch 4100-09.
b) DEWALT DWE7491RS Vs Ridgid R4513: There are peculiar functional and physical differences between the two table saws. In terms of workspace, the DWE7491RS has a wider cutting surface than the Ridgid type. In terms of weight, the two are almost similar and they both use a motor 15-Amp. Both saws also have a wheeled base but the DEWALT gives more precise and high-quality results. c) DEWALT DWE7491RS Vs Hitachi C10RJ: In terms of stands, both saws have stable rolling support. Nonetheless, there are a few functional differences between the two. For instance, DWE7491RS produces more accurate ripping results and faster sawing than the Hitachi type. Many users in DWE7491RS table saw review platforms give positive comments about the cutting machines. To begin with, most customers like the accuracy of the saw. They commend the manufacturer for precision results, and this feature distinguishes the machine from others. Secondly, a majority of customers enjoy using the saw to cut through dense and strong wood surfaces. Additionally, considering that the saw is safe and flexible for a majority of woodwork projects, customers can employ the saw in different domestic and professional projects. On a negative note, few customers are concerned with the stability of the saw and are asking for improvement. 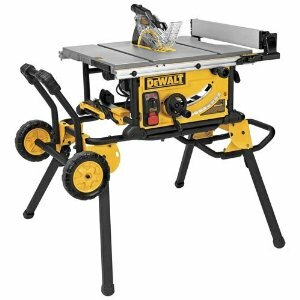 Generally, DEWALT is a highly rated and cost-effective table saw. According to many users, the saw is safely designed and give quality cutting results. Considering that it can cut through wood materials of different thickness and length, it is simply a must-have saw. Since there is warranty provision on this saw and the product is from a reputable brand, there is no doubt that this saw would be a great buy for any pro, or DIY’er.